Are fake lawns legal in Toronto? It has happened as she drives down the street, prepares to leave the house for work in the morning and mingles with locals at community events. Wherever she goes, Julie Collins finds herself being flagged down by neighbours who are amazed at just how lush and green she manages to keep her Scarborough lawn. To her surprise, her local councillor even handed her an award for its beauty a few years ago. Her secret, she says, doesn’t involve hours of weeding and watering under the blistering sun. And forget about fertilizer. 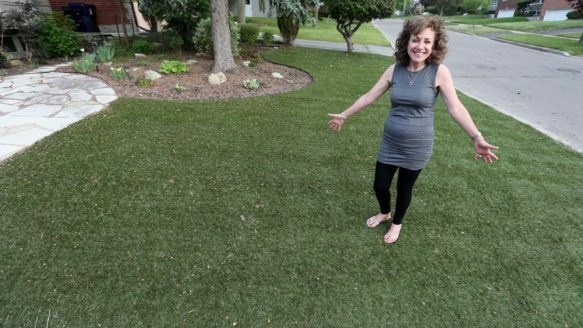 That’s unheard of when it comes to her lawn care regimen, because three summers ago she installed artificial grass. “It’s the most brilliant idea,” she told the Star, after describing how she had been through two grub-eaten lawns and many hours spent hose in hand, fighting the heat that was burning her grass, before she opted for artificial turf. But while Collins’ neighbours might be singing its praises, city officials aren’t. Despite the sprinkling of artificial front lawns in Toronto, the city’s director of transportation services, Jacqueline White says plenty of them defy right-of-way encroachment bylaws and regulations on soft landscaping. Collins claims her lawn is within the bylaw, but not all of them are. About 20 properties have been discovered over the past year to have illegal artificial lawns, caught via complaints and routine inspections, said White, who noted that the violators have been slapped with removal notices. Can you tell the difference? At left, a photo of real grass. At right, a close-up view of Julie Collins’s artificial lawn. Stintz dismisses the official grumbles, saying her lawn is completely permeable and free of drainage problems, and has become the talk of her street — with neighbours laughing as they see her and her kids out there vacuuming it every year. Artificial grass is an easy and low-maintenance way to achieve the perfectly manicured look, she told the Star. “It doesn’t make any sense to not have artificial turf as a landscaping alternative. Jerome Keays, owner of Design Turf, an artificial turf installation company, agrees. The city, he says, is hypocritical for quashing the use of the product on front lawns, because city crews have installed it on tree pits along Queen and King Sts. and on the median of the St. Clair streetcar tracks. He warns all of his customers about the bylaw but said few are scared off by the consequences, which White said could result in charges though the city works with homeowners before turning to enforcement.